Great for making your own return address stamper or professional business stamp. 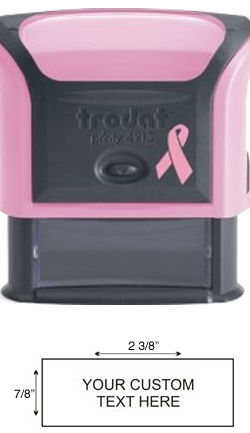 This Trodat Ideal Printy 4913 is designed with a pink mount and pink ribbon to help you show your support of Breast Cancer Awareness! Trodat donates a portion of the proceeds to help fight breast cancer. In addition to its new look, the 4913 custom stamp is now lighter in weight, smaller in size, and the world's first climate-neutral stamp. The 4913 is Trodat's best seller because it's the most versatile model in the Trodat Ideal Printy line. It can be used for all the applications covered by its smaller sibling with the advantage of adding more lines of text or enlarging the font size to improve clarity. You can create complete mini forms with this stamp. It is the most versatile model in the Trodat Ideal Printy line.